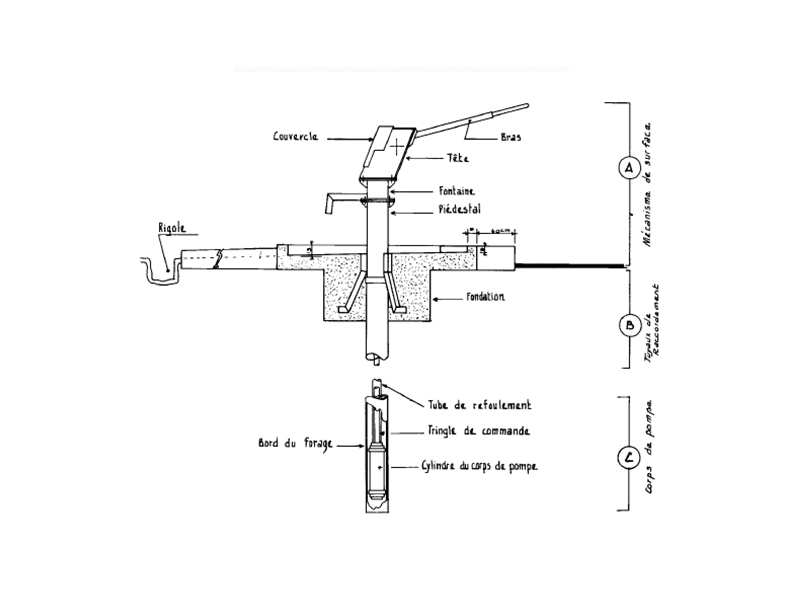 There are many different models of hand pump, so only a few examples can be provided here of models that match the main categories of pumps, a description of which along with their main specifications is provided in General Factsheet No. 35 “Main types of hand pumps. Generalities. Advantages and drawbacks”. This does not therefore mean that the models described, although they have proven themselves, are necessarily the best, nor are they necessarily better than others of a more regional nature but offering good cost effectiveness and that have proven their efficiency and ease of use and especially of maintenance, notably for village communities. It is always better to purchase a pump that best meets needs, that is easy to maintain and that comes with true after sales service as well as being well known and liked in a region, even if it is a little more expensive to purchase, rather than just choosing a low-cost pump. The following indications are therefore provided only as examples and to illustrate the data provided in the above mentioned General Factsheet as well as in Factsheet No. 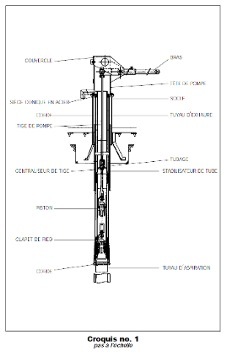 36 “How to select and maintain a hand pump” to which we recommend that you refer. This type of pump designed for wells is especially provided for use by a family or a small community of 50 to 100 people. It costs little, is very easy to maintain and is the most widespread around the world (especially in India, Bangladesh where there are six million of them, or in Africa). 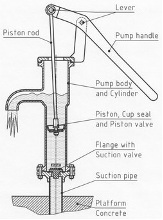 Manufacturers : Numerous, as this pump design is in the public domain. Maximum suction height : 7 meters. Flow rate : Limited but sufficient to provide at least 20 litres of water per family. Specificities : Its appearance and the materials used are highly dependent on what is available locally (often cast iron, copper and PVC). Approximate price : €60 to 100. Maintenance costs : Negligible. Advantages : Low cost, very easy to install and maintain, as the pump body and piston are above the water level and corrosion resistance is reasonable. Drawbacks : Low flow rate, limited suction height, quality is variable depending on the manufacturer and there is a need to prime the pump with the risk of contaminating the well if polluted water is used to do this. There are a very large number of different models. As examples, we will only describe two of the most well known ones, stating their main characteristics, their main advantages and drawbacks, as most often described by users or the various specialist websites and also their approximate cost. The latter aspect can only provide an indication (for actual prices, ask local suppliers), for the amounts involved may vary by country, region, place of manufacture and supplier. Note that manufacturing prices must always be increased by the cost of transportation and installation (the latter may increase costs by 20 to 40%) and also pay special attention to annual maintenance costs that are sometimes high. These are doubtless the most widely sold pumps in the world (there may be more than 2.5 million of them), due to their relative simplicity, robustness and modest manufacturing costs, now free of all royalties. This is doubtless due to the fact that they were designed in India in 1967 with support and finance from UNICEF who went on to strongly recommend them. This model does not however have a VLOM label, despite the latter being promoted by UNICEF (and granted later to the newer India Mark III pump). They are used to get water from depths of up to 50 metres. - Manufacturers : Local in many countries (SOVEMA in France). - Suction height : 10 to 45 or 50 metres. - Population served : 300 people. - Flow rate : Approx. 1 cu. metre per hour. - Weight : 130 Kg. - VLOM label : No. - Main materials used : Galvanised steel. - Price : €550 to 900 depending on quantities, suppliers and regions. - Main advantages : Ease of manufacture, robustness, the ability to support intensive use, modest cost and relative ease of installation together with easy acceptation by village communities and the ability to adapt them to a windmill or generator. - Main drawbacks : These are heavy pumps requiring a tripod for installation and to perform some repairs, all of which most often require calling in specialists who are of fairly variable quality depending on the manufacturers. Furthermore, the piston is not sufficiently sealed and all of the leather gaskets used to ensure sealing must be changed every six months or even more often if the water is sandy. 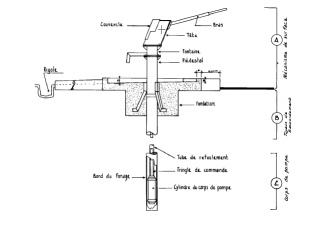 They are also not corrosion resistant, often rust and have some repairable weaknesses as shown in the illustration opposite (Source : African water studies committee and Cinam : Village trainer training manual - Comité africain d’études hydrauliques et Cinam : Manuel de formation des formateurs villageois). This pump offers the advantage over the India Mark II that it can be fully maintained by local communities (VLOM label), but its cost is almost twice that of the India Mark II. This dilemma was resolved with the VLOM 50 pump, the latest version of the India Mark family of pumps. This pump shares a similar design but has been improved to combine the advantages of an India Mark II and III. It can be fully maintained by local communities and its cost and performance are similar to those of the India Mark II. It therefore looks to be the most interesting option. An AFRIDEV pump is a robust pump very widely used in Africa and able to bring up water from depths of 45 or even 60 metres. This is a VLOM standard pump. It was designed so that the piston can be extracted without the main body of the pump so as to allow simpler and less costly pump maintenance. Nevertheless, the cost of spare parts is high and their supply situation often complex. 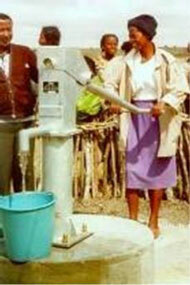 This pump is very widely used in almost all African regions. - Manufacturers : Aquadev - Monopumps and many local makers. - Suction height : 10 to 45 metres. - Flow rate : Approx. 1.3 cu. metres per hour. - VLOM label : Yes. - Main materials used : Galvanised steel, copper and PVC. - Price : €540 to 750 depending on quantities, suppliers and regions. - Main advantages : Popularity, fairly simple manufacture, so therefore often local, fairly easy installation that does not require lifting equipment but which should preferably be done by specialists or trained personnel, robustness and suitability for intense use, moderate cost, corrosion resistance and ease of repair by a trained person from the village. - Main drawbacks : Sometimes mediocre quality of the PVC used that considerably influences pump performance (very frequent wear affecting the U shaped seal, the leading cause of pump failure), quality may be less good when made by small local manufacturers or depending on the materials used, lack of reliability in hook mechanisms and difficulties in taking apart the PVC column when the latter is glued (Source : RWSN and ACF). 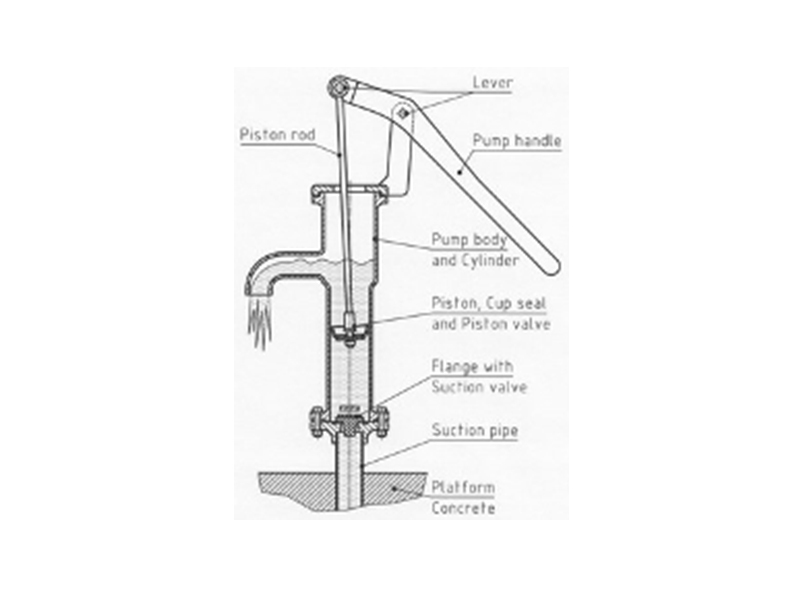 This kind of pump, where the usual triangle mechanism is replaced by a simple rope onto which small pistons are knotted at regular intervals to capture the water and draw it up through a simple PVC pipe thanks to a wheel used to drive it, it especially simple and easy to make, install and maintain. It is far less expensive than the others, but more rudimentary (costing less than €100 most often). These pumps are widespread in Central America (35,000), Africa and Asia and can pump water up from depths of up to 30 metres. 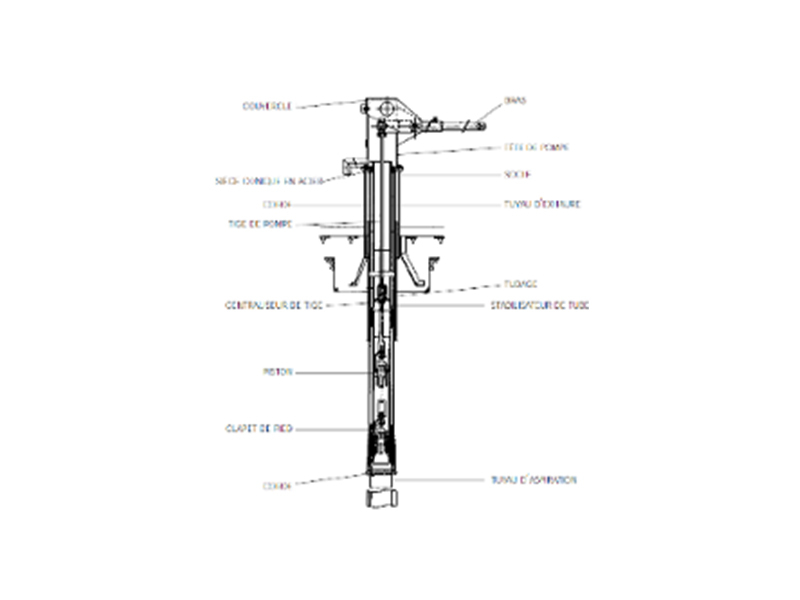 Refer to Factsheet E 38 “Rope Pumps” for a detailed description and access to videos. The BluePump, that draws its name from its blue pained casing, is a robust pump made in the Netherlands, and able to draw water from a very deep well or drilling and overcome heights of five metres. It is really an improved 2008 vintage version of the Afripumps, in turn derived from Volanta (wheel driven) pump technology. This pump can be used to fit out a new water point or easily replace another type of pump. The system comprises a steel rod linked to a lever and a cylinder, the top of which is conical in shape, containing a Teflon piston and a valve that slides within a PVC pipe. - Max. suction height : 100 metres. - Main materials used : Stainless steel and PVC. - Approximate price : €1,600. - Annual maintenance cost : €230. - Main advantages : Robustness, easy, low cost maintenance and repair, easy replacement of other model, easy to transport. - Main drawbacks : High cost, little or no local manufacturing capacity. There are many models of these pumps that standout in that they are mainly made from PVC and can be made locally, so that they are cheap, but with the downside that they are often less robust and durable and can only serve a small number of people, making them especially attractive for family use. Taking the example here of the so-called Candy Pump, invented in New Zealand and currently produced mainly in the United Kingdom and in fairly widespread use in Madagascar (a thousand), but also in use in a number of other African nations (Kenya, Malawi, Angola, Zimbabwe, Morocco, etc.) and in Israel. A CANZEE pump is a direct acting piston-less pump comprising two PVC pipes that slide inside each other and are self-lubricating thanks to a fine film of water between them. The no-return valves located at the end of the tubes are dependent on rubber disks that can be made from former tire inner tubes. - Max. suction height : 12 to 15 metres. - Population served : 100 to 150 people. - Flow rate : 20 to 30 l/minute, or 1.2 to 1.8 cu. m/h. - Weight : 20 kg. - Main materials used : ABS (a UV resistant plastic for the above ground part) or PVC below and wood. - Approx. price : €300, ex-factory, but small local workshops also make them, sometimes for less than €200. - Main advantages : Simple design, installation, use and maintenance. Fairly low purchase price, low maintenance costs, fairly good flow rate, no parts requiring lubrication, lightweight, often credited with better quality than other well known models of the same kind, like the Tara pump made in South East Asia with a price that varies from €100 to 200. - Main drawbacks : A pump primarily for family or small community use with a limited suction height. From the name of its Bolivian maker (Escuela Movil de Agua y Saneamiento), this effective pump is also in widespread use in Latin America (20,000 in Bolivia, 10,000 in Brazil, etc.) and it is one of the cheapest pumps. It can pump water from depths of up to 20 metres and force it up as high again, with a flow rate of some 2.5 cu. metres per hour. It can serve some forty people. Approximate cost : Some thirty Euros (approx. €5 per metre of depth). http://www.youtube.com/watch?v=SUVr... the latter shows how it works and is made. The most well known and most widespread pumps of this kind around the world are Vergnet pumps, from the name of the Frenchman who invented them in 1975. There are three hand operated models, depending on the suction depth required (30, 60 or 120 metres) as well as foot pump varieties (Refer to Factsheet No. E39 “The hydraulic and treadle pumps”) with very similar operating characteristics. This lightweight pump for drillings offers all of the advantages of a hydraulic transmission system combined with the ease of use of an India pump. It can supply a water tower and be installed or removed in less than an hour without the need for special handling equipment. Its technology is reliable and well proven at over 50,000 water points around the world supplying 40 million people. - Manufacturer : Vergnet (France). - Maximum suction height : 60 metres. - Flow rate : 10 l/minute (0.6 cu. m/h) at 60 metres, 25 l/minute (1.4 cu. m/h) at 25 metres. - Weight : 10 kg. - Main materials used : Stainless steel and high density polyethylene. - Price : €1,750 (for 30 metres), ex-factory, but with one of the lowest maintenance costs on the market (€15 to 30 per year). Main advantages : Very easy to install, operate and maintain by village communities as all of the wearing parts are found at ground level and are easily replaced, robust construction, corrosion resistant, perfectly watertight with good after sales service in many countries (3,000 repair specialists and 350 stores). Main drawbacks : High purchase price, guarantee cover limited to three years on the expandable bladder bag (baudruche) which costs some €230 to replace, whereas the pump’s service life exceeds 15 years. These pumps are less often used. Their operating principle is described in Factsheet No. 35 “Main types of hand pumps. Generalities. Advantages and drawbacks”. They use a helicoidal rotor actuated from the surface by a double handle turning within a stator). - Maximum suction height : 100 metres. - Weight : 4 to 500 kg depending on depth. - Main materials used : Galvanised steel, cast iron and brass. - Approximate price : €2,200 (at 60 metres). Main advantages : The ability to draw water from great depths, solidity, no use of valves and seals, thereby reducing wear related phenomena, a force height of 15 metres, the ability to add motor power later on and the ability to use the pump with water laden with impurities. Main drawbacks : High cost, corrosion risk, complex installation, a handle that is sometimes hard to turn for some people, maintenance and repairs requiring specialists. This kind of fun pump is a relatively recent one that is seldom seen, except in some English speaking African nations where its use is being developed by a US NGO called PlayPump. This pump is powered by a rudimentary merry-go-round for kids that is installed right over the pump. When the kids turn the merry-go-round, its horizontal motion is converted by a system of gears into a vertical motion that powers the pump. Advantage : This system is a fairly simple one, well suited to kids who find it fun. Drawbacks : Not yet in widespread use. Mainly installed near schools, the pumps do not run every day (but they can be linked to storage tanks). They also require supervision and maintenance. You may refer to the various documents mentioned in General Factsheet No. 35 “Hand pumps”. http://www.rwsn.ch/prarticle.2005-1... but when arrived to RWSN portal, you have to search for this document. A CD updated with the Standards for Man-powered Pumps (Version 2009) may also be purchased from the RWSN secretariat for US$ 50. For further information please contact noro.robson@skat.ch. - ACF (Action Contre la Faim) : A 27 page document entitled “Le Pompage”. http://www.watersanitationhygiene.o...).pdf, but sometimes ACF adducts some documents. 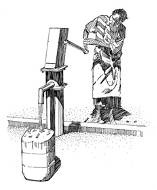 - WaterAid (NGO, London) : A seven page summary covering hand pumps, in English. http://www.wateraid.org/uk/what_we_... but when arrived to Water Aid portal, you have to search for this document.